Inspyral’s Jeremy and Kelsey Philo bring spectacular roving atmospheric entertainment to this year’s Global BASH. All day long and into the night, audiences will be wowed with stilt walking, juggling, hula hooping, LED glow dancing, and children’s entertainment, including interactive juggling and plate-spinning for kids. Jeremy and Kelsey met at a park in Norman, Oklahoma on a warm, spring day in 2012. Kelsey had been hula hooping in solitude when a friend told her about the group of unicyclists and jugglers practicing in the park. She showed up with her hoops, and the rest is history. They started Inspyral in 2015 and Jeremy proposed soon after, while on an outing to teach Kelsey how to unicycle. They were married in 2015. 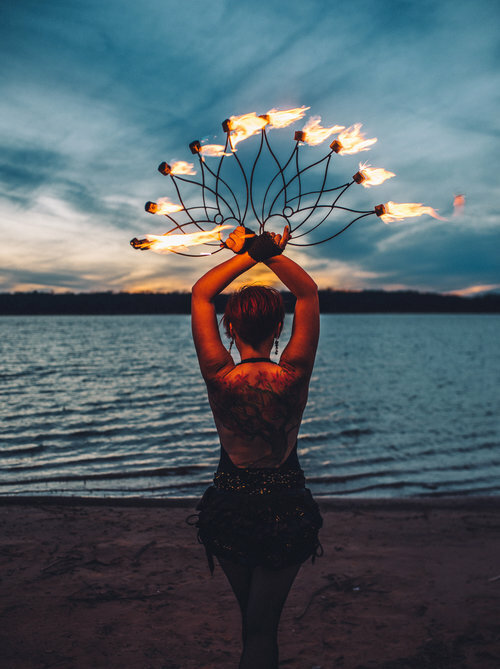 They couldn’t help but put on a little fire performance to show their closest family and friends what they love to do.